There’s nothing quite like the pure satisfaction of dipping a sweet or salty snack into a rich, creamy pool of decadent chocolate. Or having that chocolate delicately enrobed over your favorite treat in a photo-worthy fashion. Whatever you choose, both processes of melting chocolate require the finest quality and freshest supplies to achieve just the right velvet fluidity. Enrobing is a melting technique in which a thin waterfall of perfectly tempered chocolate creates an exquisite coating for nuts, pretzels, popcorn and more. 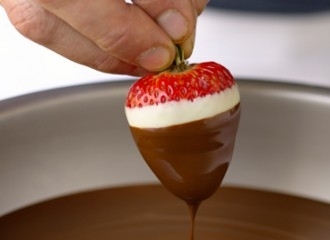 With similar qualities to dipping chocolate, it enjoys the added visual delight of very minimal bumps, bubbles or ribbons of extra chocolate. Royal Wholesale Chocolate has an extensive selection of chocolate coatings and colored dipping chocolates available in bulk to help you create a beautifully decorated dessert for special events, parties, holidays and more. Through our quick and easy online ordering, you can stock up on the top names for baking chocolates like Merckens, Ambrosia, Wilbur and Peter’s. As one of the largest wholesale suppliers of colored dipping chocolate, chocolate coatings and chocolate wafers, you can buy everything you need in bulk to create your favorite chocolate desserts over and over again.